Library: a place in which all sorts of amazing are waiting to be borrowed. I believe that books can do just that, propel us toward freedom. When absorbed in a book you can be transported to another place and time. You can learn about other peoples, other lands. You can become an expert on a subject. A book can change your life, how you view the world. ie The Holy Bible or In Defense of Food by Michael Pollan or a biography of some influential person. When I am lonely or fidgety or bored I love to read. I have been that way since childhood. As a child my favorite place to go was to the library. You were allowed to check out 8 books, so I used my eight and my sister's eight every week. My goal was to read every book in the children's section of our library. I never made it but I did read a lot of great books I wouldn't have chosen otherwise. Libraries are great sources for so many things now. I know that you could (and many do) homeschool your children strictly from material you borrow from the library. We used it extensively when we homeschooled. My library system has a world class geneology section, an Art Gallery, meeting rooms, TV station(not real sure how it works though) they offer classes on computers and other interesting things. It is one of my favorite places to "run away to". My kids and I can spend hours at the main library in town. Lynxes (I think that is the plural of lynx - I could look it up AT THE LIBRARY! So if you don't already have a library card please go get one and use it liberally! 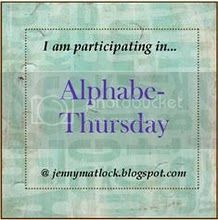 I am participating in Mrs. Matlock's Alphabe-Thursday. All the other students have lovely posts - go check out the Linky to read their assignments. I'm with you Christy! I am a big fan of the library! I have a past post about our downtown library. Right now I am listening to a story on CD in my car. I love that libraries have so much more to offer. Did you ever go to the book mobile as a child? By the way this is happy mrs c forgot to sign my hubby out! I have my library card! I love the library and miss it so much being overseas. Your post brought up memories of how special library day was as a girl. Thank you. i also loved the L things you could look up there. Thanks for coming by too. I'm going to add the Augustine quote to my favorites. I love the library and am a proud owner of my very own library card! We love the library too. The wonderful programs and dear people that work there would be on our list. I really have to get back to going to the library. We have very good ones around here. I mostly went when my son was young but then I stopped. He still is very fond of it though. I'm an avid reader and huge library fan. My boys have had their own library cards since they could write their names. Great post! 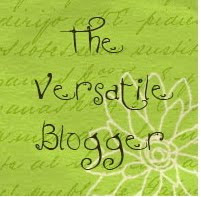 Love yr 'L' post & love yr blog! Thanks for stopping by & look forward to *seeing* you again next Thursday!! I love libraries too! Big reader here. I started a children's lending library at our church, with everything from books and puzzles to board games and puppets. We had a story hour in the library every month for kids 5-12, instead of having them go to the regular service. I think they got more out of that story and game time than they ever did sitting in a pew. Christy, I couldn't agree with you more. I was raised by a very poor, struggling single mom who took us to the library every week. Those books opened worlds to me and made me the person I became. In one of my earlier blogs, I posted a poem I wrote about going to the library. Great "L" choice!! I am excited. My youngest is almost old enough to go to the library. Hope the library is still there and funded. Love the Library! Sadly don't get to use one these days but my childhood was very much library driven - I read so many books as a child and that has stayed with me throughout my life. As a retired school teacher I applaud your library ideas. Reading is so much fun and the love of reading is priceless. You should yell BECAUSE LIBRARIES ARE AMAZING! We live in a big city adn the libraries here are pretty astounding. They are always crowded with people on the computers and busy stacks! I really enjoyed this L stop on this weeks Alphabe-Thursday journey! Mrs C - never got to go to the bookmobile. I love books on CD's! Jo - I have a room we call the library, not as wonderful as you describe but full of books. Riet - thanks, I love books too! Steph, glad you liked my Augustine quote. PJ - I am a proud owner of my library card also! Kathy - I would be embarrassed to admit how many shelves of books I have - even being a library patron! Viki- you will be glad you've gone back! Joni, I know I would pay for the privilege too if I had to. Tina - my kids have had their cards since they could sign their names also. RMWoman - I checked your "about me on your blog" and I have the same addiction to bookstores. You will be glad you discovered the library again! Lola - thanks for the kind words, look forward to "seeing you" again also! GardenofDaisys - how wonderful of you to start the library at your church! jaydubblah! - you are welcome thanks for stopping here. Carmen - I looked for the poem but couldn't find it, the books I have read have made me who I am also. Julie - shut-up! (lol) I hadn't even considered that libraries would be closed. Your kids will love the library! Easternsparkle: I am still smiling about your son. I agree the books I have read are still with me. EVERYONE- if you are still here, thank you for stopping by! When I learn to email from comments I wont need to do this this way. This is my first time participating in alphabet Thursday! What fun! The library is one of my favorite places to spend a week-end afternoon. I am an avid reader and it provides so many of the resources you mentioned! Great post. The library was my favorite place as a child, I spent many, many hours there each week. Not so much these since I download free books online but I still stop by sometimes. Our library in our small town does not get a lot of newer books in often. But I can get on line and order in from other libraries in the system. I am thankful for that because I used the library in the city all the time. I just really miss having enough to browse through so I can spend some time there. I love libraries and books too! so great....i don't spend near enough time at the library. thanks for the inspiration...i think hubster and i will make our way to our local next week! Great L post, as a child I used to love visiting the library and would read and read for hours. Still do! We even have a room called the "Library" here at home and it is a very tranquil place to curl up with a book, anytime. I wrote about my son last week for Alphabe-Thursday. He has always loved to read and from the age of nine or ten I would drop him off at the library while I ran errands (this was before we worried about leaving children alone in a place like the library...it's a different world now). It was always his favorite place to go. Wonderful post. I have always loved the Library!! At one time I wanted to be a librarian! I have always read and can't imagine life without books. I am a library junky. When the kids were little I'd get a babysitter once a week so that I could have an undisturbed hour in the library - really. These days I visit on a regular basis - dip into the history, biography, gardening aisles on my way to the fiction and home-decorating. I always have a special feeling of anticipation when I walk into a library. I love library! Sometimes, I spend the whole morning there just to look around..
Did you mention children's story hour - a place that begins it all for kids! Such a thing to look forward to. I still need to get a library card in my new city. I'm actually pretty excited about exploring the different branches. Hoping they have a huge genealogy section! I think libraries are one of the treasures of our worlds!!! I love them, they let everyone read......what a gift that is! I just love libraries! We try to go at least once every other week : ) They have a wealth of knowledge in those doors. : ) Books are beautiful! I've been getting audiobooks from the library for my long commute - totally saves me!! Thanks to everyone who commented. I love the library and am glad you all do too! I grew up going to the library, and try to take my kids often, but our's is not open on Saturdays (boo hiss) and we can't always get there before it closes after school, since I'm a teacher and stay late most days. Luckily, the librarians at my school are gracious enough to let my kids check out books whenever they like, now that they don't attend my campus anymore! Libraries rock! We live within walking distance of ours! Lentil Soup or "Shorabat Addas"